It can often be disappointing when you’re both a vegan and a lover of chocolate. Most name brand chocolate bars are chock full of big vegan no-no’s – most commonly milk. You’ll be hard-pushed to find dairy free chocolate bars sat on the newsagent counter and you’ll have to do some sleuthing if you’re looking in supermarkets. But if you’re new to the vegan lifestyle and still want to experience the taste of your favourite big brand chocolate bars, this is where Go Max Go comes in. This American-based company doesn’t just make vegan-friendly chocolate bars, they make chocolate bars designed specifically to imitate the taste of your favourite chocolate treats. Get the same taste from dairy-free chocolate! The Buccaneer, for instance, has a delicious nougat filling and a coating of delectable dairy free chocolate that give it a strikingly similar taste to something that…well, let’s just say it rhymes with ‘silky hay’. 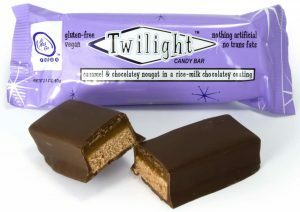 Their Twilight bar is a delicious treat that’s simply out of this world, and more closely associated to that red world that occupies our solar system. The chocolatey caramel taste is accentuated with a delicious, vegan-friendly rice milk chocolate coating. On top of recreating famous mouth-watering tastes, they also make their chocolates to a high standard of ethics. Go Max Go work exclusively with fair trade cocoa when producing their chocolate bars. They source their palm products from an official member of the Palm Oil Innovation Group; ensuring that all palm used has been obtained from a sustainable source. Each one deliciously replicates a name brand chocolate without the use of artificial ingredients or corn syrup and instead relies on natural ingredients; without compromising on taste. We’ve got lots of Go Max Go chocolatey delights available on Ethical Superstore, and don’t worry; we’ve cleverly worded our descriptions to give you an idea of what each chocolate bar is emulating. Are there any name brands you miss since becoming a vegan? What are your favourite kinds of vegan chocolates? Let us know in the comments below!